We offer healthy, balanced, tasty meals featuring local specialties. Our meat comes from local producers where it is raised in the open air. The majority of our vegetables are from certified local organic producers. We are also able to cater to vegetarians, as well provide gluten and dairy free diets for people with allergies. Please inform us at time of booking of any special dietary requirements. In accordance with the rules of a “licence petite restauration” it is not permitted to bring alcohol into the gite. This is carefully done with the help of a dust extractor which has a certificate TUV”Adapted for people with allergies.” In addition the curtains, rugs, chairs and mattresses (Benoist Belle Literie) are dry cleaned in place using anti allergic products. Our daily cleaning products are all Eco certified. For organized groups it is possible to arrange all-inclusive breaks or weekends on various themes (walking, cooking, fishing, botany, painting…) including transfer from the station to the gite. Please ask us for more information. HOW TO GET TO THE GITE? Exit no 30 Thiers-Est follow direction Pont de Celles, Celles sur Durolle. Continue on the D7 for approximately 3kms ; at the Col du Frissonet follow directions to Ste Agathe/Vollore Ville. Sortie n°31 Noirétable,direction Noirétable puis Vollore-Montagne puis Viscomtat. 300m after the Col du Pertuis there is a sign to Rochemulet, take the dirt track on the left. 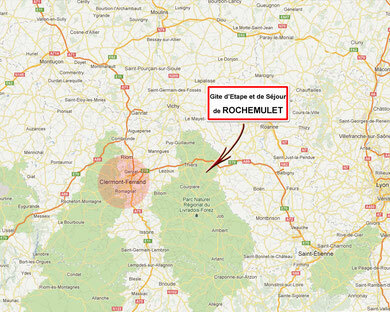 Go through the hamlet of Chabany and at the fork take the left track, continue for 2 kms in the oak forest. At the hamlet of Rochemulet take the first turn on the left for the gite. During the winter, when there is snow special equipment is essential for your vehicle. 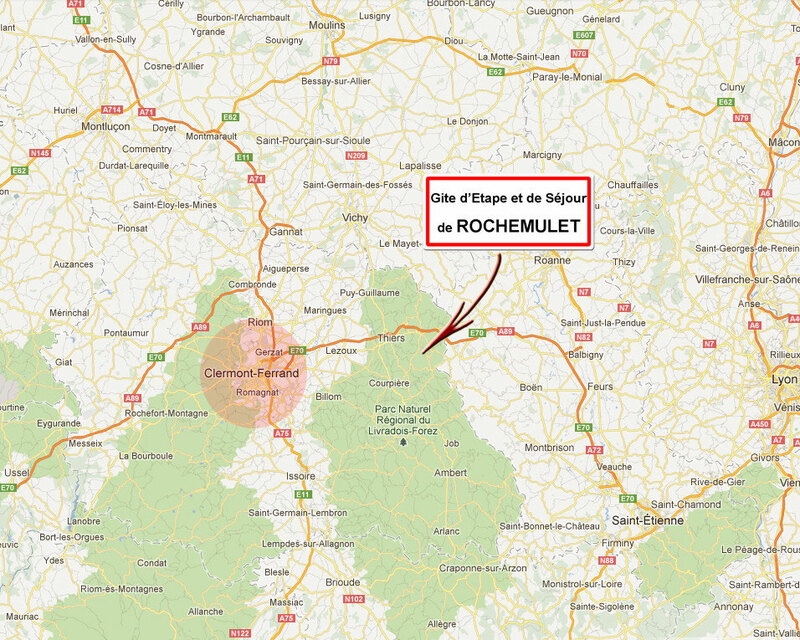 It is possible to leave your vehicle at Celles sur Durolle or at Col du Pertuis and we will come and pick you up. Arriving at either Vichy or Clermont ferrand stations change trains for Thiers which is our nearest station. It is possible to meet you there.